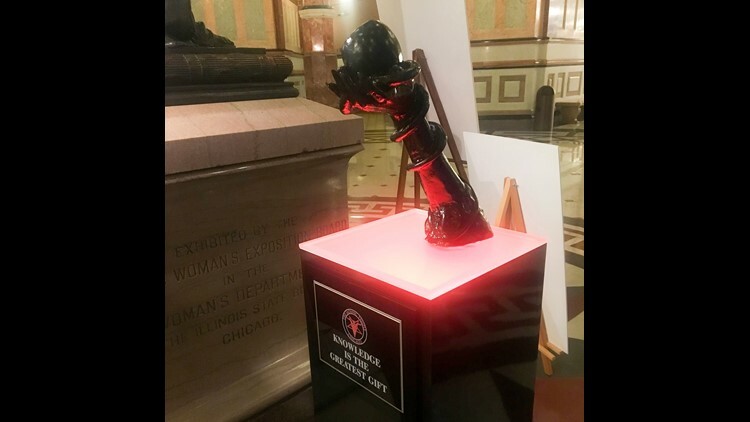 This display from The Satanic Temple-Chicago has been placed in the Statehouse rotunda at the Capitol in Springfield, Ill. It joins the Nativity scene to mark the Christmas season and the Menorah to mark Hanukkah. A statue from The Satanic Temple-Chicago is now featured in the Illinois Capitol rotunda for the holiday season. The display, which features a woman's hand holding an apple as a snake wraps around her forearm, joins a nativity scene to honor Christmas and a menorah to honor Hanukkah. Lex Manticore, a spokesperson for the city's Satanic Temple told The State Journal-Register that the statue represents a Biblical Eve eating the forbidden fruit from the tree of knowledge. "We see Satan as a hero in that story," he said. The statue, known as "Snaketivity" from a crowdsourcing campaign, displays a plaque saying "Knowledge is the greatest gift." Because the Capitol rotunda is a public place and the display wasn't funded by taxpayer dollars, Illinois Secretary of State spokesman Dave Druker said the group has the same rights as other religious organizations to put a display there. In the past, the Capitol has featured other displays challenging religion, including a sign from the Wisconsin-based Freedom From Religion Foundation declaring religion a "myth" and an aluminum Festivus pole installed by a Springfield resident.